Out of the many private detective shows that made it to the television screen, the Rockford Files was the best. It’s lead character Jim Rockford was played by legendary actor James Garner. Rockford was a former ex-con turned talented private investigator. His great knack for solving even the most difficult cases never seemed to turn into financial security due to the inability of many of his clients to pay. It was living from pay check to pay check that had him driving a Pontiac Firebird Esprit instead of the more upscale Firebird Formula or Trans Am of that era. Rockford may have been low on funds but he was a class act, he lived in Malibu, California but it was in a trailer parked in a beach parking lot. Rockford’s Firebird Esprit allowed him to cruise in style. It was a car that was classy enough to park in front of a Hollywood mansion or chauffeur gorgeous guest stars like Lauren Bacall. The Rockford Files had a long run from 1974 to 1980. Rockford always drove a gold Esprit. The show started off with showcasing a 1974 Firebird Esprit and ended production with a 1978 Firebird Esprit. It’s the show’s 1977-1978 Firebird Esprit that is most recognized as the Rockford Firebird. Pontiac updated the Firebird for 1979 with a new front-end and rear-end design, yet a 1979 or 1980 Firebird was never used as Rockford’s car in the show. When several newer Rockford Files TV movies were produced during the 1990s, it was the 1977-1978 Firebird Esprit body style that was used instead of a 1990s era Firebird. Ironically, a production Firebird Esprit was never used in the show. All Rockford Firebirds left the factory as Firebird Formula models. Since the Firebird Formula was equipped with a better handling suspension and could be equipped with more performance oriented engines such as Pontiac’s 400 cubic inch V8, clearly the Formula was a better car for the stunts the TV show required. When a new Formula arrived on set it received the Rockford treatment which included the removal of the rear spoiler, removal of the twin scoop hood, removal of all Formula badges and/or decals, and painting the exterior in an unique shade of gold. This allowed TV audiences to be tricked into believing Rockford drove a run-of-the-mill Esprit which had the performance capabilities of a Firebird Formula to tackle the show’s toughest stunts. All Rockford Firebirds used the same unique shade of gold which wasn’t a factory Firebird color even though Pontiac did offer different shades of gold exterior colors on some of its Firebirds during this time period. 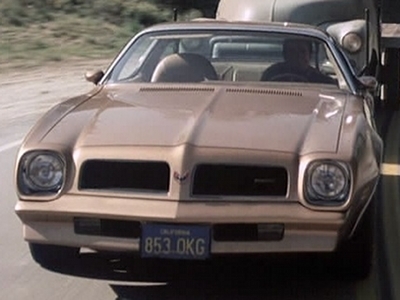 The Rockford Files production team decided to use it’s own unique gold color so all Rockford Firebirds would be the same shade of gold throughout the show’s production life. Gardner was a accomplished race car driver and he did many of his own driving stunts. Garner’s Rockford character always ended up in the hornet’s nest where he was an active participant in a high speed car chase. Even though Garner’s fantastic portrayal of the crusty Rockford is the stuff TV legends are made of, the fantastic car chases kept many viewers coming back week-after-week to watch the show. The Rockford Files had really good plots, great acting, a great cast of regular characters, and excellent guest stars. 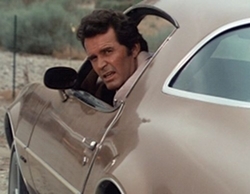 However it was the great car chase scenes and even those normal scenes where a gold Firebird Esprit was center stage, that have made the Rockford Firebird a legendary TV car. The Firebirds used in the show were produced during the Firebird’s golden era. It’s no coincidence that the Rockford Files TV show was also produced during the golden era of Television. The combination of the Rockford Files and a Firebird Esprit proved to be the perfect TV sitcom marriage.